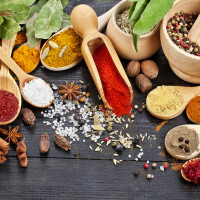 Home » Nutrition » Healthy Eating » Top 10 Ways to Have a Taste Party with Herbs and Spices! Getting your family to enjoy spices and herbs can be fairly easy. In plenty of cultures kids are eating foods full of flavor in their youth. My own daughter loved cinnamon lightly sprinkled on her O’s cereal as young as one. It was no surprise she loved garlic chives, jalapeno olives and red onions at two years of age. Spices and herbs are full of fantastic health benefits for your heart, brain and other organs. It’s best to enjoy them with meals and not as supplements. If your family hasn’t lived with a festive of flavors at meal time –start gradually adding them in. Sprinkle apples with cinnamon or cardamom. Add cinnamon to a fruity-chilled-herbal-tea for the kids and add to coffee for the adults. Try adding a bit of turmeric to apple sauce –it adds lots of color, a mild flavor and is packed with health benefits to keep your memory sharp and your mind uncluttered. Herb Chicken: Chop up garlic chives, fresh parsley and lemon zest then mix with Italian bread crumb. Dip chicken in olive oil and roll in your herb-bread crumb mixture. Bake and enjoy. This is always a hit. Keep a seasoned herb blend on the kitchen table in place of the salt shaker. I like Trader Joe’s 21 Seasoning Salute. Add cumin to recipes like guacamole or sweet potato fries. Let your kids experiment. My daughter loves chili powder and paprika on her turkey lunch meat. Buy a salad-sprinkle-herb blend to add to your salads, dips or potatoes. I prefer Frontier Seasoning Blends Salad Sprinkle. Veggie Pancakes: Shred potatoes, zucchini and carrots in a big bowl, add 1-2 eggs, a little bit of olive oil, parmesan or feta and any of your favorite herbs like cumin seed and curry powder, basil and oregano, or Herbes de Provence. Lightly fry and enjoy. These are great with low fat sour cream that’s mixed with the same herbs you used for your pancakes. Try whole cardamom seeds. Let your children smash them open with something safe and with parent supervision. We use a rubber mallet or meat tenderizer but you could probably use an old jar lid and just press down hard. Eat and enjoy without any additions. Lastly, be sure to date your herbs when they enter the spice cabinet. I keep a permanent marker on the shelve. Most will keep their potency from 6 months to a year. After that they don’t have the same health benefits although they still may add some flavor. Comment on Top 10 Ways to Have a Taste Party with Herbs and Spices!